For nine years the husband and wife team of Kevin and Lisa Haime have been aiming to make a difference in the lives of junior golfers and others from the Ottawa community. 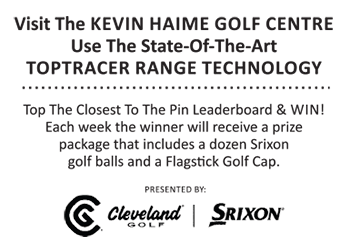 On May 10th, on the occasion of the 9th edition of their Kevin Haime Kids To The Course Classic golf tournament, the evidence of their success was on full display. That came in the form of table full of young people at the back of room during the closing dinner at Eagle Creek Golf Cub in Dunrobin. The “jam-eaters”, as master of ceremonies Dean Brown refers to them, was a cross-section of the young people who have benefited from the Kevin Haime Junior Golf Initiative, the main beneficiary of the day’s events. To date more than 540 junior golf memberships have been purchased by the program, with more than a $500,000 raised and funnelled directly back into the community. This year’s event added almost $56,000 to the total. Nicholas Brisebois, an 18 year-old who has been part of the program since it began, spoke eloquently to the attendees who enjoyed the day of golf, camaraderie and the presence of some special golf guests. Brisebois recently signed a letter of intent to attend Ivy League school, Columbia, where he will study Pre-Med. He conveyed to the crowd how much the program has meant to him, not only in support of his golf, but the lessons he has learned from it that have made him a better member of the community. Spearheaded by the Haime family, who operate the Kevin Haime Golf Centre in Kanata, the couple, along with sons Jake and Jackson, have worked tirelessly with the support of many to make the event and the program happen for nearly a decade. A key supporter is Dave Wilson of PING Canada. The General Manager of the Canadian branch of the major equipment manufacturer contributes greatly to the prizing for attendees and this year added a whole other level of contribution with an appearance by PING staff player Brooke Henderson and her sister, Symetra Tour member Brittany.